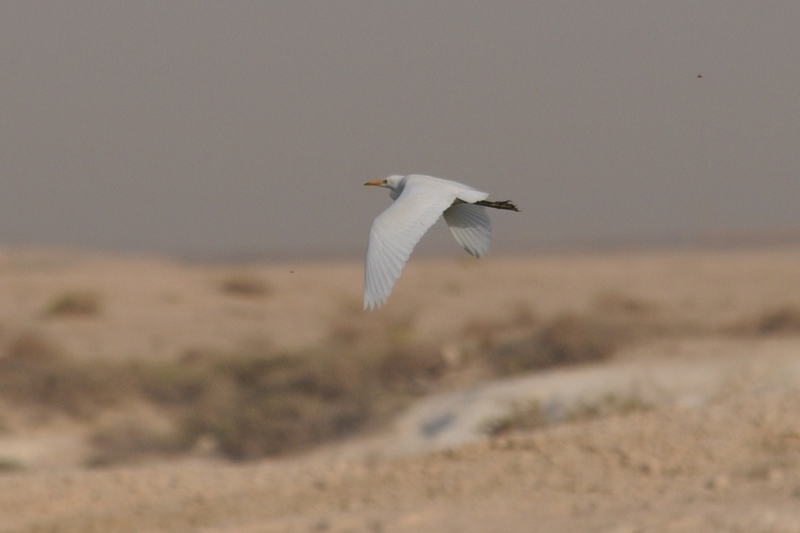 Birds of Saudi Arabia: Western Cattle Egret Summering? The migration season has all but finished and very few birds are left in Dhahran. The percolation pond has been filled back up with wastewater for treatment and many of the birds that were enjoying the shallow water and muddy edges created by the low level in the pond have moved on. Today, and for the last few weeks (since 13th May 2011) a single adult Western Cattle Egret has been frequenting the Spray Fields and roosting around the Percolation Pond. Western Cattle Egret is a common winter visitor to the region, although a resident population occurs in the South West. It is rare in the summer months in the Eatern Province so possibly this bird has decided to summer in Dhahran. The last birds seen in the winter had moved on by 18th April.